The Residence Inn by Marriott Pittsburgh Oakland/University Place, located at 3341 Forbes Avenue in Oakland, opened earlier this summer on June 21. This 10-story, 144 all-suite custom Residence Inn has everything a visitor needs for an extended stay in Oakland’s commercial district. David Cocco, President and CEO at North Star Lodging & Development, is proud of the building’s construction and recent opening, and he looks forward to giving residents a pleasant experience. The hotel has a ‘Residence Inn Mix’ – a social program offered to the residents Mondays through Wednesdays from 6 p.m. to 7:30 p.m. There’s Make Your Own Soda on Mondays, Off The Grill on Tuesdays and Local Fare–provided by a featured local restaurant–on Wednesdays. “The residents love it, and we encourage them to relax and enjoy what we have to offer!” said Cindy Dohmlo, General Manager. The hotel has three different floor plans: Studio Suite (350 s.f. ), 1 Bed (495 s.f.) and 2-Bed (700 s.f.) and all the modern amenities an Oakland over-nighter needs and more. “We’re proud that we had the collaborative efforts from everyone involved in the development of this hotel: MassaroConstruction Group as our general contractor keeping everything on time and on budget, Hospitality Furnishings & Design for executing their ‘urban/European interior design-work’, TKA Architects, Marriott International and of course the Oakland community,” said Cocco. “Make My Trip Count” Commuter Survey Results are In! More than 20,700 commuters took the time to make their trip count and told us how they get to work. Results show that many commuters use multiple modes, less than half drive into work alone, and walking and biking is growing. Click HERE to see the full infographic! Tinsy Labrie, VP of Marketing at VisitPITTSBURGH & Georgia Petropoulos, Executive Director at Oakland Business Improvement District present the benefits of collaboration at the Oakland Summit sponsored by the Wyndham Pittsburgh University Center Hotel. (Left) Leaders in Oakland’s Arts & Culture gathered on the patio for drinks and hors d’oeuvres on Wyndham’s patio prior to the meeting. The Oakland Summit is focused on gathering these teams together to help envision a more collaborative future. Check out the Pittsburgh Post-Gazette article on the how Oakland is ‘gearing up’ for bikes! There’s even a few words from OBID’s Executive Director, Georgia Petropoulos. Exciting developments in the future! The Oakland Forever Schedule Has Been Revealed! The results are in! Oakland Forever unveils its schedule of events! Thank you for sharing your ideas for Oakland Forever, a fantastic two day celebration of Oakland, its residents and community members, and accomplishments over the last 175 years! Your input has been vital in the planning process. The votes have been tallied, each suggestion read, and now,the schedule is posted! 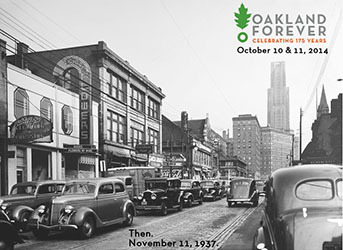 While events are still being added, we invite you to be among the first to see the exciting events planned for Oakland Forever!